Tea-leaf reading is a form of divination I really like. I'm not as good at it as I am with tarot reading, but there is something lovely about having a cup of tea, drinking it while considering the questions you have about life, then studying the leaves at the bottom of the cup to find the answers. Well, I guess being English I would think that tea solves every problem, wouldn't I? The Cup of Destiny and book come in a lovely box lined with silky red cloth. You can see the cup on the left in the photo at the top. It is covered with arcane symbols and looks rather wonderful. The book explains how to use it. Now, the normal way to read tea-leaves uses an ordinary teacup - ideally one that is white inside. You make a pot of tea using real leaves rather than teabags, pour a cup without using a strainer, drink the tea, turn the cup upside down to get rid of the last dregs of liquid, then look at the leaves to tell your fortune. The shapes that the leaves form and their position in the cup indicate things that are likely to influence your life in the days, weeks or months to come. The book that comes with The Cup of Destiny describes the traditional way of reading tea-leaves in great detail. It includes long lists of symbols you might see in the leaves and what they can mean - as well as tips for training your psychic abilities for this kind of fortune telling. 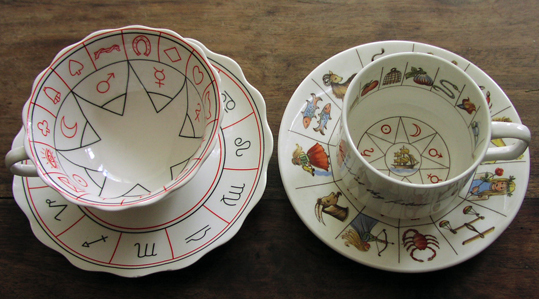 It also describes the way of using the cup's symbols for fortune telling - which you can either think of as a kind of parlour game or as an introduction to the more traditional type of tea-leaf reading. Basically, you look at which of the printed images are stained by tea-leaves and then look in the book to see what that means. For example, the letter means you will get some important communication and the heart indicates love. The bottom of the cup has astrological symbols. If the leaves fall there it suggests your future will be influenced by that star sign. The book gives a short description of each meaning. Why I am particularly glad I have got this book is that I already owned a cup of destiny. It is the one on the right in the photo at the top. I inherited it from from grandmother, but had never seen any instructions on how to use it before now. Both cups are similar enough that the instructions in the book have taught me what to do. A long-term mystery has been solved and I am delighted. I also have to say that reading tea-leaves with a cup marked with identifiable symbols is much easier than the traditional method using a plain cup! The Cup of Destiny can be bought via Amazon and is published by Connections. I think you can pick up the book on its own quite cheaply second hand. How is it possible that a tea leaf reader saw all the choices I would make in this lifetime about 25-30 years ago? I did follow that path to a T. I thought I was doing the right thing and did not listen to my inner voice, didn't think I had a choice so when I went back to her MANY years later, after one of the major incidences, things did not change for me and now I'm unable to find a way around this b/c the ending is not good at all. I just want to understand WHY I went this route and I did not make any of what she said happen so what choice did I really have to change anything?? I haven't been able to get a doctor or any other person to understand what is happening with me. The one person who kind of "gets it" cannot explain to me how to fix it b/c my mind is doing something all on it's own... I did go back to the tea leaf reader one more time about 2 yrs ago and she saw the ending again. I did not pay attention b/c she did not tell me yet I know exactly how I'm going to die and since I can't get anyone to help me and I am not depressed, I can't seem to change it unless I go back and change one of the major decisions I made in 2008 or 2014. I just don't understand how she saw all of this that many years ago... please enlighten me... please. Thank you so much. I believe it is possible to change the fate seen in predictions - the future isn't fixed. possible outcomes are seen, that's all.